Network operators are increasingly deploying scale-out, spine-and-leaf IP fabric architectures, built with fixed-configuration switches to support growing east-west traffic in the data center. 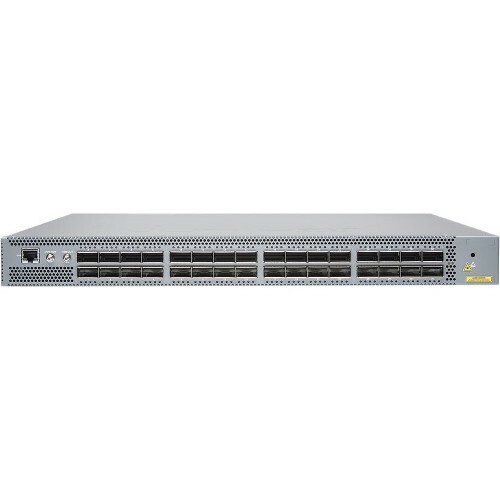 The Juniper Networks® QFX5200 line of next-generation, fixedconfiguration leaf/access switches offers flexible, cost-effective, high-density 10GbE, 25GbE, 40GbE, 50GbE, and 100GbE interfaces for server and intra-fabric connectivity, providing deployment versatility, investment protection, and future-proofing for today’s data centers. In addition to leaf deployments in IP fabric architectures, the QFX5200 switch is also a great fit for multitier, multichassis link aggregation (MC-LAG) network implementations commonly used in enterprise networks. Like other QFX Series switches, the QFX5200 supports advanced Layer 2, Layer 3, and MPLS features. For large public cloud providers-among the first to adopt 25GbE servers to meet explosive workload growth-the QFX5200 enables very large, dense, and fast IP fabrics based on proven, Internet scale technology. The QFX5200 runs the same reliable, high-performance Juniper Networks Junos operating system used by network operators around the world. The QFX5200 supports a disaggregated version of Junos software with a modular architecture that allows the switch’s control plane and data plane processes and functions to run in parallel, maximizing utilization of the high-performance quad-core CPU. The QFX5200 is a compact, 1 U platform featuring 32 quad small form-factor pluggable plus (QSFP+) transceivers or QSFP28 ports, with two redundant 850 W AC/DC power supplies and five fan trays. A QSFP28 module can be used for a 1x100GbE connection or 2x50GbE or 4x25GbE connections using breakout cables. A QSFP+ module can be used for a 1x40GbE connection or 4x10GbE connections using breakout cables. The QFX5200 features a high throughput 6.4 Tbps Packet Forwarding Engine (PFE). Control plane performance is further enhanced with a powerful 1.8 GHz quad core Intel CPU with 16 GB of memory and 64 GB SSD storage. The QFX5200 includes the following capabilities. Please refer to the Specifications section for currently shipping features. High-density configuration: Offering 32 ports of 100GbE or 40GbE and delivering 6.4 Tbps line-rate switching performance, the QFX5200 is optimized for high-density fabric deployments. Flexible connectivity options: The QFX5200 offers a choice of 10GbE, 25GbE, 40GbE, 50GbE, and 100GbE interface speeds for server and intra-fabric connectivity, providing deployment versatility and investment protection. Rich automation capabilities: The QFX5200 supports Zero Touch Provisioning (ZTP) and Juniper plug-ins for OpenStack Neutron and CloudStack NetworkGuru. Proactive application/flow path analysis is available via the Juniper Networks Cloud Analytics Engine to operationalize network monitoring and optimization. Advanced Junos OS features: The QFX5200 switch supports features such as BGP add-path, MPLS, L3 VPN, and Fibre Channel over Ethernet (FCoE). Disaggregated Junos software architecture: The QFX5200 supports a disaggregated version of Junos software with a modular architecture that allows the switch’s control and data plane processes and functions to run in parallel, maximizing utilization of the high-performance quad-core CPU.